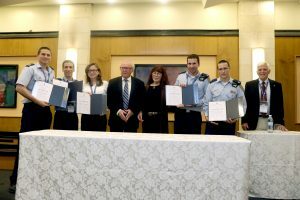 The conference, which was held for the 57th time, was jointly organized by the Technion’s Faculty of Aerospace Engineering, Ben Gurion University of the Negev, Tel Aviv University, the Israeli defense industries, Ministry of Defense, the IDF and other organizations. 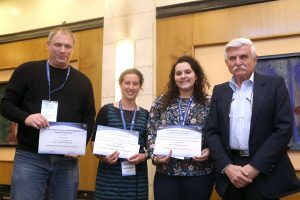 More than 500 engineers, scientists, and experts from Israel and abroad participated in the conference, during which inspiring plenary lectures and 20 parallel sessions showcased a diversity of fields at the forefront of technology. These include Combustion Processes and Propulsion Systems, Guidance, Estimation, Navigation and Control, Flow Control, Computational Fluid Dynamics, Aeroelasticity, Optimization, Fluid Dynamics and Mechanics, Aerospace Structures, System Engineering and more. In addition, the conference included an Industrial Projects session and a unique Student Project Competition session. One of the plenary sessions was dedicated to two student projects that have reached high places in important international competitions – the AUVSI project by students from the Technion, and the DBF (Design-Build-Fly) project by students from the Tel Aviv University. In the exhibition hall, various industries displayed their products and a variety of companies presented corporate videos. The Chair of the Organizing Committee was Mr. Avi Blasberger, Director of the Israel Space Agency. 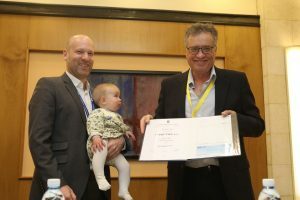 The Chair of the Program Committee was Dr. Yuval Levy, CEO of Israel CFD Center (ISCFDC) and an adjunct lecturer at the Faculty of Aerospace Engineering at the Technion. The Conference & Marcom Coordinator was Ms. Vered Seginer. The members of the Organizing Committee were senior representatives of the major industries, the IDF, and the academy. For an article (in Hebrew) on the Technion’s website, giving highlights from the plenary lectures, click here. For details on the Invited Plenary Speakers and their talks, click here. For the online conference program, including abstracts of all the talks, click here. 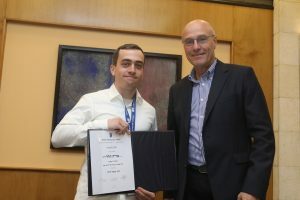 A young faculty member – Prof. Daniel Zelazo, for excellence in research in the fields of Multi-agent Systems and Networked Dynamic Systems and for his publications in leading Journals such as the IEEE Transactions on Automatic Control. In addition, Dan redesigned the syllabi of the compulsory control lab classes and offered new and advanced elective classes. A Ph.D. student – Federico Roizner, for his PhD research entitled “Aeroservoelastic Stability Analysis Using Response-Based Parametric Flutter Margins” (under the supervision of Prof. Emeritus Moti Karpel). 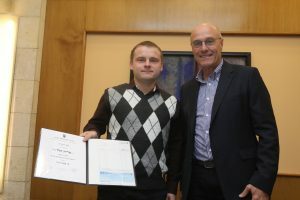 Ph.D. student Pavel Galich, for his PhD research entitled “Manipulating elastic wave propagation in non-linear flexible materials via external stimuli’’ (under the supervision of Asst. Prof. Stephan Rudykh). M.Sc. student Daniel Kariv, for his research on “Dynamic Response of an Elastic Aircraft to Store Ejection” (under the supervision of Assoc. Prof. Daniella). 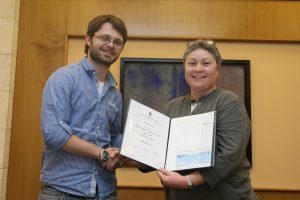 Ph.D. student Roni Tsalik, for his research entitled “Optimal Guidance and Control for Imposing Impact Angle and Time” (under the supervision of Assoc. Prof. Tal Shima). Michael Iovnovich, for his paper entitled “F-16 Aircraft Ground Vibration Test Analysis Using Advanced Multi-Patch Estimation Techniques”. Asst. Prof. Oksana Stalnov, Tuvia Kogan, Michael Faran, Hadar Ben-Gida, for their paper entitled “Noise Reduction of a UAV Propeller Using Grit-Type Boundary Layer Tripping”. 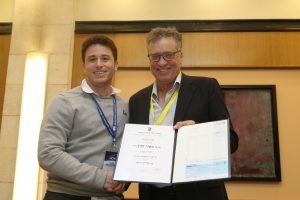 The Student Project Competition Prize in Memory of Dr. Shlomit Gali was awarded to Alvaro Ringel, Asaf Kuflik, Avishai Hassidof, Husen Sweid, Leora Hochstein, Liran Sahar, Ortal Cohen, Ofek Katz, Vladimir Perepech, and Yifat Regensberg, for the project “Aerial – Drilling Rigs Defense Missile” that was supervised by Mr. Oded Naveh.